Labor Day week. 8 days for price of 7 & lower price Last July/August week remaining for 2019! 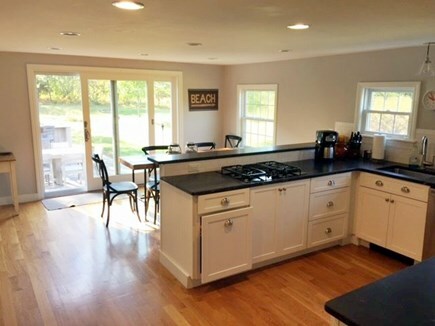 This beautiful, large home (6 bedrooms, 3 baths) is located in Harwich Center adjacent to the Bike Trail. 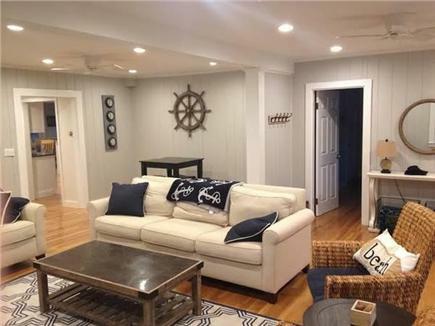 The entire house was renovated in the last 24 months and is perfect for two families vacationing together or a large, extended family reunion/vacation. This house sits on over an acre of land and sleeps 12-13 people comfortably. 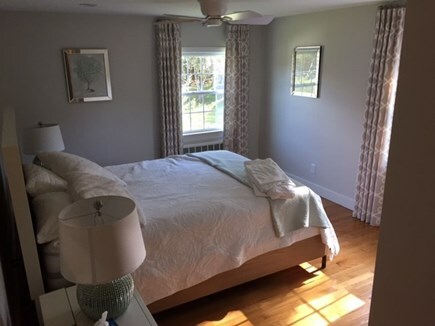 The entire first floor was completely refurbished in 2015, with a new kitchen, new appliances, new bathrooms, new beds, new furniture, and new or refinished hardwood floors throughout. 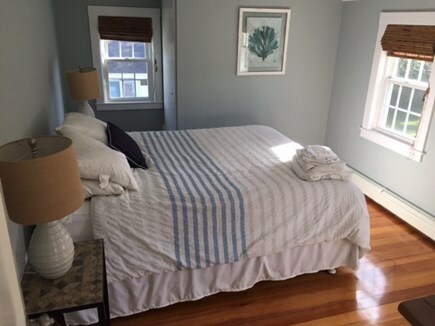 The entire second floor was completely refurbished in 2016, with a new living room, new bathroom, new beds and new or refinished hardwood floors throughout. 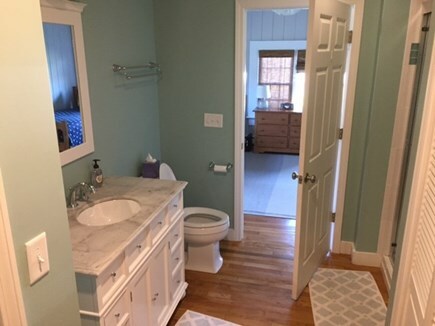 Both floors were freshly painted and a new outdoor shower was installed. 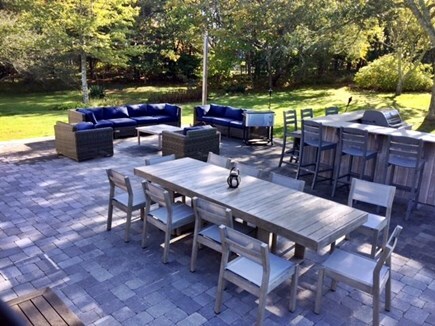 We also just added a large patio with outside bar/grill/fire pit and added fencing and driveway/walkway. 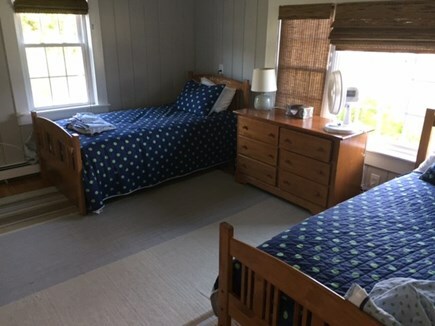 The house has cable television, two HD TVs, WiFi, gas grill, ceiling fans throughout, window unit AC, washer/dryer, linens, beach chairs, beach towels, and also a small office area with a printer for anyone taking some work with them on vacation. 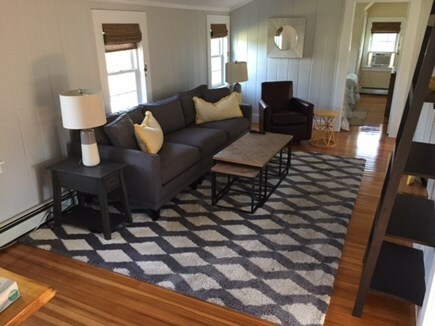 Living Room -- Large room with a 60'' flat-screen HD TV, with sofa, love seat and armchairs and 4-seat pub table for board and card games. Kitchen -- Fully equipped stainless steel, granite kitchen with dining table. Master Bedroom -- Queen bed with new full bathroom. 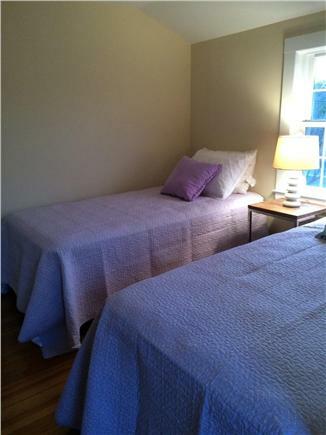 2nd Bedroom -- 2 Twin beds with Twin Trundle bed and new full bathroom (w/full size washer & dryer). 3rd Bedroom -- 2 Twin beds. Master Bedroom -- Queen bed w/ new full bathroom. 2nd Bedroom -- 2 Twin beds. 2 large driveways. Slider off kitchen leads to mahogany steps down to large patio and flat, grassy back yard containing outdoor eating area with gas grill and brand new outdoor shower -- perfect for relaxing and entertaining family and friends. There is also a firepit for toasting s'mores. The large, private back yard is ideal for summer fun like wiffleball, croquet, badminton and cookouts. The Old Colony Rail Trail, which has been converted to miles of walking/jogging/bike paths, cuts through the rear of the property (beyond some bushes and other natural screening) and connects to the larger Cape Cod Rail Trail less than a mile away, meaning you can bike up and down and all around the Cape to reach countless beaches, kettle ponds and town villages, all without ever riding the streets. Brooks Park, a public park with well-appointed tennis courts, baseball fields, basketball courts, swing sets, jungle gyms, bocce courts and a gazebo for summer concerts, is a mere 5 minute walk away along the Old Colony Rail Trail. There are also many nearby inlets and tributaries for sea kayaking and other water sports. Marinas are close for fishing charters, as is a high-speed ferry (2.5 miles from the house) for day-tripping to Nantucket. The Harwich Mariners, the town's Cape Cod League Baseball team, plays at Whitehouse Field, which is adjacent to Brooks Park and also an easy walk from the house. The Cape Cod League is the premier summer college baseball league in the country, and counts many Major League Baseball players as alumni. Admission is free, and the games make for a great family night out. For golfers, Cranberry Valley Golf Course, one of the Cape's most acclaimed public courses, is across the street (and has one of the best driving ranges around if you just want to hit a bucket of balls). Other public courses, such as Captains Golf Course, Highland Links, Bass River and Chatham Seaside Links, are nearby. Additional availability info: Last Week of August - only a 3 day minimum!. This is a Sunday to Sunday vacation rental. Additional pricing info: $235 cleaning fee (includes linens), State and local taxes of 12.45% will apply. We just loved this house for our family gathering. The outdoor space was perfect for a cookout with plenty of room for kids too run around. The patio and fire pit was a great spot for s'mores and the outdoor furniture made fun last longer. The house was comfortable for a large group with a very large living room where everyone could gather and spend time together. David and Micheal were a huge help with any questions we had. We rented this home for 3 nights for 3 families - totaling 12 adults. We were all in town for a series of wedding events. This home could not have been more perfect! It is stunning, spacious, clean and has all the amenities you would want. There is plenty of room for everyone - and no one got in each other's way! It's that roomy and so well laid out. 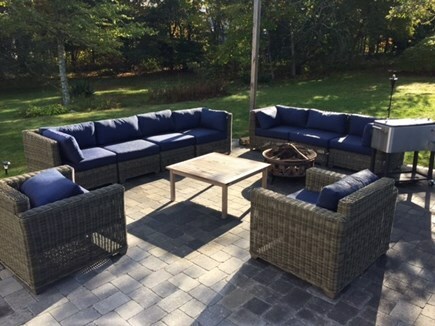 We were very lucky that the weather was fabulous and we could take advantage of the beautiful back yard with all the comfy couches, sitting area, tables, etc. Having the bike path in the back of the house was an added bonus!! Check in was so easy! Mike was so easy to work with! This is our third year renting this house and we can’t wait to come back. The location is fantastic, it is right on the bike path. Huge rooms and tons of eating area for large families. 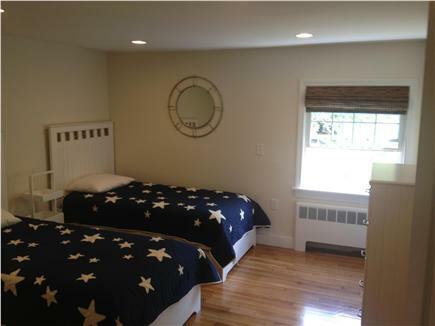 Towels and bedding included which is always a bonus. The owners couldn’t be easier to deal with. Every year there are home improvements and the trash and recycling is seamless. Can’t say enough about this place! Although we were a family of ten, we seemed to have plenty of space in this spotless, tastefully decorated home. The downstairs living room was large and comfortable with all the amenities while the upstairs had a smaller but nice TV room. The kitchen -also large- had all the modern equipment needed. It opened to a huge, landscaped backyard . My family took advantage of the bar, the barbecue, and fire pit....including cooking lobsters midweek. They also loved the “rail trail” - two rode bikes while the rest of us hiked/walked. Lastly, Mike-one of the owners- was very nice and always responded quickly to our question or needs. I can't say enough about how amazing this house was! The backyard is to die for - perfect for a large group staying at the house! The house is stocked with everything you need and great for groups that are looking for space and not being on top of each other!!! We definitely want to come back again!! Mike was great to work with too - very quick to respond and shared updates that had been made to the house in the off season. The house is clean, has all the amenities for sleeping, cooking, back yard barbeque, huge TV, even books to read. Large comfortable kitchen, huge washer and dryer. Beautiful landscaping enhances the property. 11 of us had wonderful sleeping arrangements. I WOULD RECOMMEND THIS PROPERTY TO MY MOTHER-IN-LAW!!!!!!! Beautiful, immaculate, spacious home with great outdoor space! 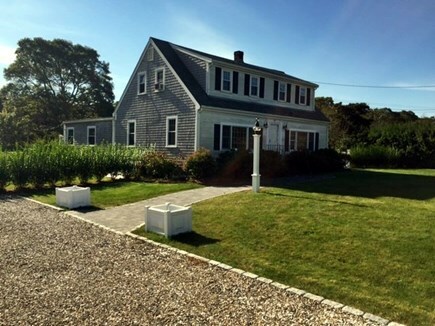 My family of 4, my brother's family of 5, and my parents stayed at this home for a long weekend when we were on the Cape for a family reunion/memorial for my aunt. The house was absolutely spotless, very tastefully decorated in a beach theme, fully stocked with everything we needed, and was not only spacious enough to accommodate all of us (ages 3-70), but also comfortably accommodated 11 more family members for lunch when rain interfered with other plans. My family was so grateful to have such a lovely home for the weekend, and with the rain we weren't even able to make use of the fabulous patio/fire pit/outdoor space. This was our first experience renting a home directly from an owner through a website, and every aspect of the transaction went flawlessly. In fact, Mike was so responsive and personable that it felt less like a transaction and more like staying at a home as the family's guests. When we had to contact Mike at 8 AM on the Saturday of our stay, he could not have been more gracious, and he sent his contractor right out to make sure we had everything we needed. This house exceeded all our expectations! We had a large, family gathering for Thanksgiving. It is much larger inside than it appears from the front of the house. It was extremely clean and very tastefully decorated with a beach theme. The kitchen was very well stocked with appliances, cooking equipment and dishes. We didn't lack for anything. There is a large living room with TV and game table on the first floor. Upstairs is a smaller living room with TV, perfect in our case for those who wanted to go off and watch football or teenagers who wanted to hang out and watch their movies. We purchased this 2 family in 2014 and have extensively renovated it and made it a one family. I bought it with my brother and another friend and we use it ourselves but rent it out some in the Summer. We will continue to make it more and more luxurious as we want to use it ourselves as much as possible! Everything is brand new. Enjoy! 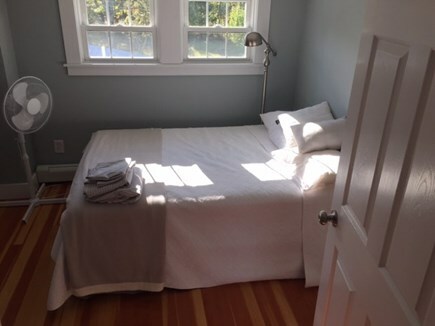 Also - we have more reviews and pictures at Airbnb - google ''Harwich gem totally renovated'' and you will see them. Contact me by email and I will get back to you very quickly. Click on the ''Send email'' button on my listing. The house has a huge yard - over an acre. With direct access to the rail trail in the back yard. Kids can be entrepreneurial (and safe) and set up a lemonade stand! 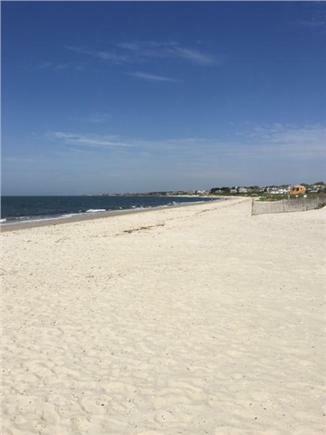 Harwich Port, with its many restaurants and shops, is a few blocks away, and the town's Bank Street Beach (picture posted) and Red River Beach are less than 2 miles from the house. Nauset Beach and the spectacular Cape Cod National Seashore are about 10 miles away. For incredible sunsets (ideal for dinner and cocktails on the beach), Mayflower Beach on Cape Cod Bay is a great spot and also about 10 miles away.